Valparaiso, is the the most important commercial and military port of Chile, capital of the homonymous region, located 116 km. NW of Santiago, the national capital. It is perhaps the most representative city of Central Chile, for its abrupt geography and idiosyncrasy of its people, it has also been an inspiration source for many songs about its hills, the beautiful "porteñas" (women of Valparaiso) and all kind of life stories. Valparaiso has more than 300,000 inhabitants, making it the third largest city after Santiago and Concepcion, but Greater Valparaiso, which includes the neighboring communes to which is currently connected, reaches a population of over one million inhabitants, the second urban center in Chile. Valparaiso is also known among Chileans as "Pancho" and "La Joya del Pacifico" ("The Jewell of the Pacific") for its seascape, history and picturesque architecture of houses erected on its dozens of hills. In times of its greatest splendor (second half of the nineteenth century) it was also known among sailors as "The Little San Francisco". The city was declared a World Heritage Site by UNESCO on July 2, 2003. 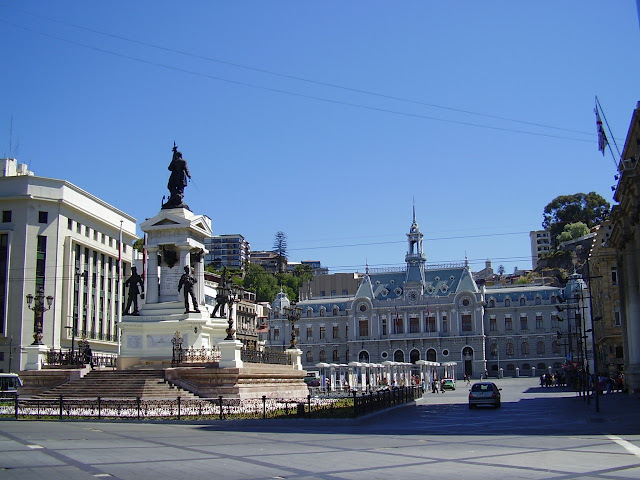 One of most emblematic buildings in Valparaiso is the seat of the National Congress, which was moved here during the military government with the purpose of giving more importance to the regions, however this has been a controversial issue for the fact of being located the Legislature and the Government in different cities. As the main commercial and military port of the country, Valparaiso is also seat of the Chilean Navy Headquarters and of many organizations related to marine life. In terms of weather, Valparaiso is classified within what is a Mediterranean Climate, with a large concentration of clouds and characterized by rainy and rather mild winters, in contrast to summers that are extremely dry, with the occurrence of many forest fires, the average annual temperature is of 14 ° C. Below I give you a list of interesting places. Cerro Concepcion, whose name comes from the old Fort stood there for defense for the city, there is an influence on the ancient buildings of the first European settlers arrived at the place. One of the most prominent places of the neighborhood is Saint Paul's Anglican Church, built by the English engineer William Lloyd in 1858, which was the first temple of this religion in Valparaiso, professed by most of the members of the British colony resident. For their part, in 1897 the Germans raised the Lutheran Church of Valparaiso, located a couple of blocks from the Anglicans. 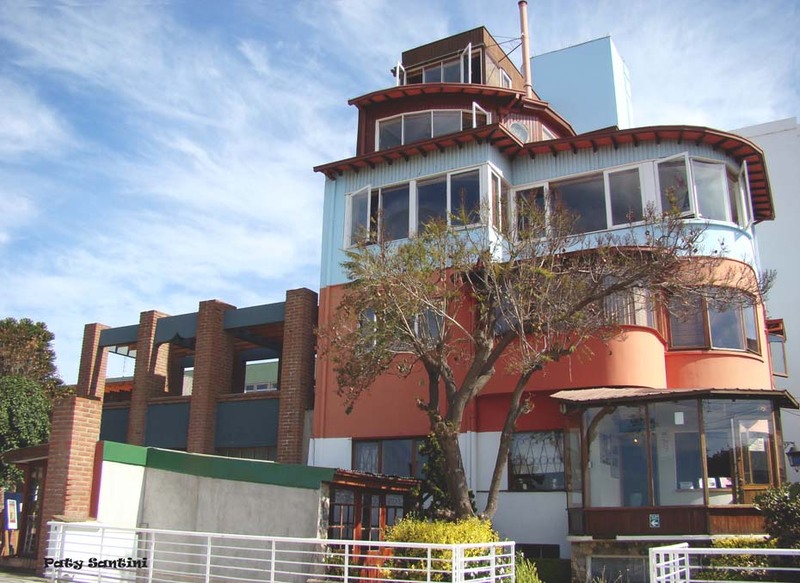 Also worth mentioning are the lookouts, with spectacular views of the bay, "Paseo Atkinson", "Paseo Gervasoni", "La Casa de Lukas", House - Museum and Cafe showing the most outstanding works of a famous Chilean cartoonist, Renzo Pecchenino, whose pen-name was "Lukas". Cerro Alegre, next to Cerro Concepcion, whose first civilian resident after the Spanish Conquistadors was the English merchant William Bateman. Bateman was followed by other compatriots who had come as immigrants to the city thus forming a residential neighborhood consisting of houses of a higher level of construction than the usual at the time, with amenities and gardens which contributed to beautify the place. Among the typical places of the hill can be mentioned Palacio Baburizza, a historical monument built in 1916, located in the Paseo Yugoslavo of Cerro Alegre, whose name comes from its second owner, a Croatian entrepreneur of the first half of the twentieth century. The house became the Municipal Museum of Fine Arts of Valparaiso in 1971. Next is located the Victorian style mansion Palacio Astoreca, built in 1923 by the Croatian immigrant Francisco Petrinovic, who made a fortune during the golden age of saltpeter, today with a renewed air as it was turned into a Hotel - Boutique. 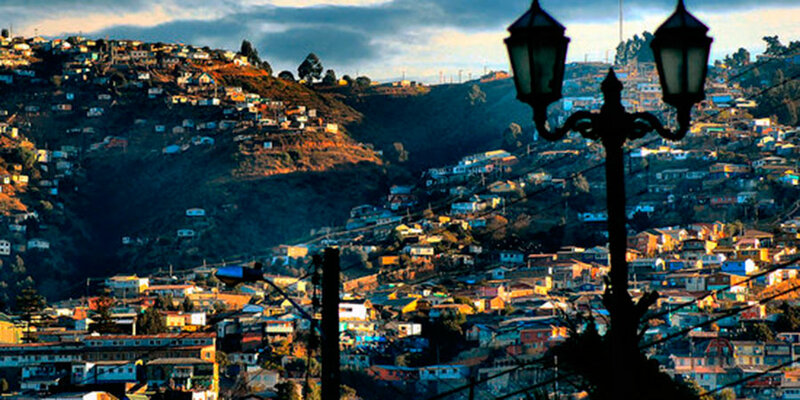 Cerro Bellavista, owes its name to the beautiful view it offers over the Bay of Valparaiso. Cerro Bellavista was chosen to create the Museo A Cielo Abierto de Valparaiso, outdoor tour to admire 20 murals until now, by renowned artists who have visited the city. By the way, in recent times, many city walls are full with Street Art, of very good quality, by local artists. You can hire guided tours to see the murals and graffiti of the hills, making visitors can know in detail the dozens of these works and even paint their own creations. In Cerro Bellavista is also the Cristo Redentor, inaugurated in 1904 and destined to protect the port. This sculpture is attributed to Eduardo Provasoli, a famous Italian architect of the time, who designed a number of churches throughout Chile. Cerro Artilleria, another of the hills that stands out for its incredible architecture of houses almost hanging from the slopes. Its name comes from the Artillery Barracks located at the top. Among the attractions is the Museo Naval y Maritimo de Chile, Paseo 21 de Mayo, the Artilleria and Villaseca Funicular Railways, craft fairs, Casa Artilleria No. 156, ancient house built between 1908 and 1909 by the Italians Renato Schiavon and Arnaldo Barison, one of the most photographed sites in Valparaiso because of the location on which it is built (Photo heading this post). Cerro Baron, at the east end of the "plan" (lower part of the city), on this hill is located the "Iglesia de San Francisco" (San Francisco Church), a temple full of history and which has suffered at least two major fires. San Francisco Church gives the nickname "Pancho" to Valparaiso as in the past this temple was the most recognizable point for sailors arriving to the port. (Spanish, name Francisco= nickname "Pancho"). Nearby is situated El Almendral neighborhood, with many important places like the National Congress, the Municipal Theatre, the Cathedral, Plaza Victoria (Victoria Square), the Church of the Twelve Apostles, O'Higgins Square, the Mercado Cardonal, and other attractions. Due to its rugged geography that includes more than 40 hills, the displacement of people is often through the mistakenly called "ascensores" (elevators) which are actually funicular railways. The only elevator in the strict sense is that which leads to Cerro Polanco (Polanco Hill), it has 100 years since it was inaugurated in 1916, National Monument of Chile from 1976. Although there is a comprehensive restoration program of the local lifts, it must be pointed out that all the funiculars are long-standing, for example the one located in Cerro Concepción was the first built in America, about the year 1883. 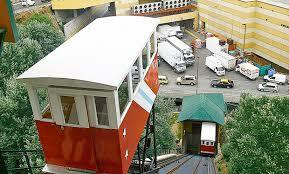 At some time there were more than 30 funicular lines working in Valparaiso, today only some of them are in operation. Other important "ascensores" are the Ascensor Artilleria, from 1893, built to transport officers and sailors of the Naval Academy, its wagons are the largest and interesting for its colorful painting, including modern designs. Its upper station is located at Paseo 21 de Mayo, one of the main lookout points of the city. Ascensor Baron, since 1906, located in the homonymous hill, connects Avenida España at the lower part of the city with Avenida Diego Portales at the top, Baron was the first funicular to work with an electric motor, thus replacing the old system of water counterbalancing. As I said before, the Ascensor Polanco is the only true elevator of Valparaiso. It is also very original because its gateway is preceded by a 150 mts. long tunnel that recalls a mine gallery. Ascensor Reina Victoria, at Cerro Alegre, built in 1902 and Historical Monument since 1998, thus called in honor of Queen Victoria of the United Kingdom, who died in 1901, one year before its construction. Its route is very short, only 40 meters, but the gradient is very steep, 52 °. Ascensor El Peral, since 1901, connects Plaza de Justicia in the lower part of the city with the Paseo Yugoslavo in Cerro Alegre, one important tourist areas of Valparaiso, with stunning panoramic views of the city, where is located the Palacio Baburizza, seat of the "Museo Municipal de Bellas Artes" of Valparaiso. Paseo Atkinson, located in Cerro Concepción, along a beautiful row of gardens of old large houses belonging to the nineteenth century. Paseo Atkinson is constantly visited by national and foreign tourists, attracted by the particular view, arrangement and maintenance of the large houses. Paseo Gervasoni, adjacent to Paseo Atkinson, with a privileged view towards the bay and also surrounded by large houses of the nineteenth century, featuring the Casa- Museo de Lukas, Cafe Turri and Hotel Gervasoni, which is the oldest building of the hill. Paseo Yugoslavo, which was one of the first promenade viewing- platforms of the city, located precisely on Plaza Sotomayor, one of the nerve centres of Valparaiso. From here you can see the entire "plan" (sea level part of Valparaiso). Here is situated Palacio Baburizza, currently converted into the Museum of Fine Arts of Valparaiso. Paseo 21 de Mayo, traditional and attractive promenade located at Cerro Artilleria, daily visited by tourists from around the world, is one of the most important sites of interest of Valparaiso to get an excellent view of the harbor and city, easy and fast to arrive from the downtown. The coast of Chile covers more than 4300 km. in length, so the history of the country and life experiences of its people are closely related to the sea. The exhibition is located in the facilities of what formerly was the Escuela Naval (Naval Academy) at Artilleria Hill, the aim is to preserve and spread the Chilean naval history, with exhibition of various objects such as model ships, weapons, uniforms, flags, logbooks, letters and many valuable documents and relics. Its collections contain more than 3,000 three-dimensional objects and with respect to literature and documents there are more than 30,000 volumes. It is the main pictorial exhibition of this important region of Chile, since 1971 its seat is Palacio Baburizza, building dating from 1916, property that belonged to the Croatian businessman Pascual Baburizza, located at Paseo Yugoslavo of Cerro Alegre. This museum exhibits important collections of Chilean and European painting of the nineteenth and twentieth centuries, the pieces have been gathered since 1895 and today is rated within the four most important art collections of Chile. The Natural History Museum of Valparaiso was founded in 1878 and from 1988 is located at 1546 Condell Street, building known as Palacio Lyon. The first owner of the construction was Santiago Lyon, by his father he was a direct descendant of the Scottish Royal Family. The compilation is organized into four types of collections: archaeological, ethnographic, anthropological and bio-anthropological areas.